Hello, darlings! Hope you’re enjoying the sun as much as I do! 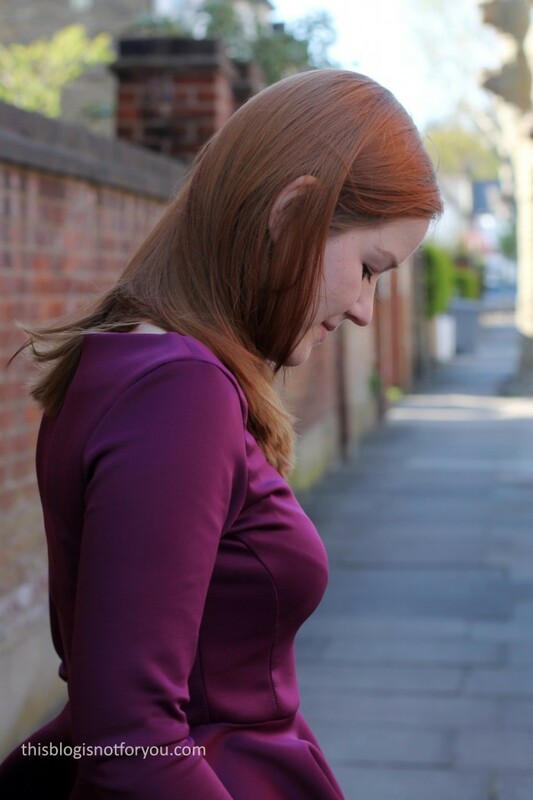 I took the opportunity to take some pics of one of my latest make, a scuba jersey peplum top. I bought this scuba jersey on Goldhawk Road, for just around £3/m. I only bought 1m as I was initially planning on making a mini skirt with it. The fabric is very soft and stretchy and surprisingly comfy to wear. At first, I was afraid I would sweat a lot in this, but it’s actually not as warm as it looks. Unfortunately (and not surprising for the price), the fabric’s quality is rubbish. After the first wash the fabric was fuzzy in some places which is quite annoying as it stands out quite a lot on the slightly shiny fabric. I love the modern look you get when using scuba jersey. It’s just slightly more elegant than normal jersey fabric. 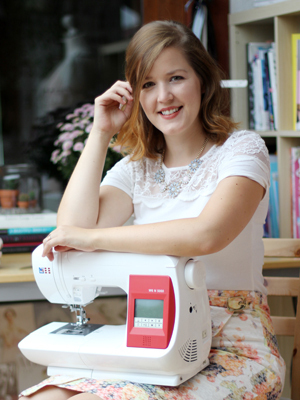 And it’s a dream to sew with! It cuts easily, doesn’t fray and is more stable than normal jersey. For the bodice I used my TNT Lady Skater Dress pattern (by Kitschy Coo), which I have used so many times already. 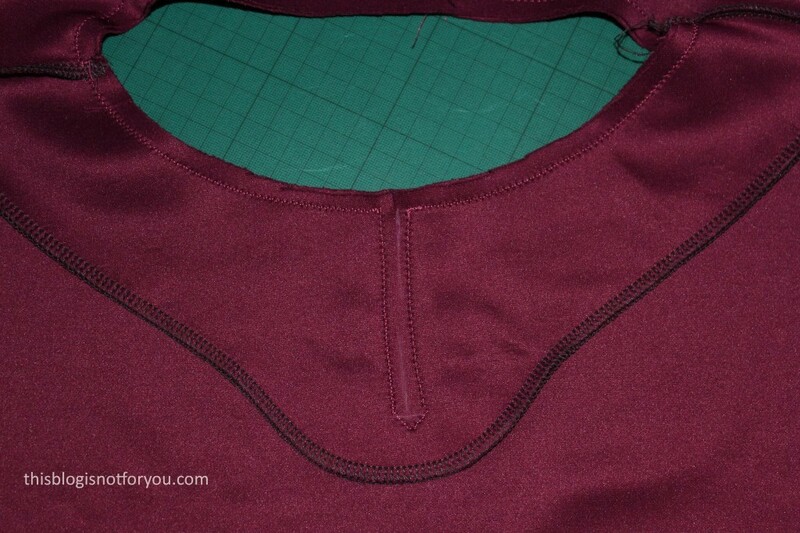 I often use it as a jersey sloper and change it a bit here and there to create new shapes. 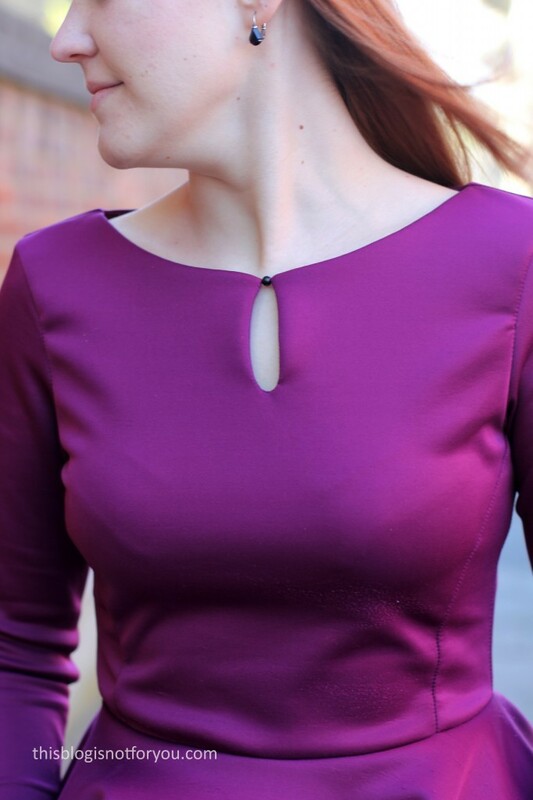 This time I re-used my previous Lady Skater pattern hack, the one with the princess seams and boat neck. 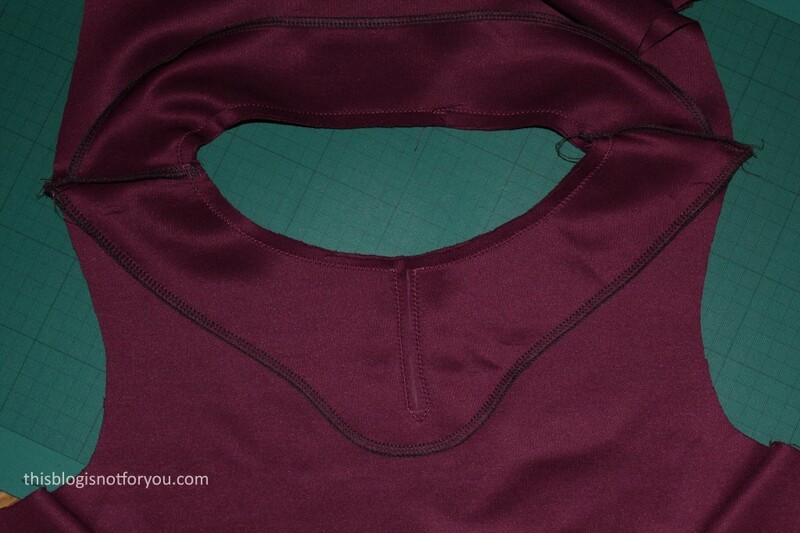 I raised the waist by a couple of inches and added a keyhole detail to the front neckline. I also added a full circle peplum to the waist. 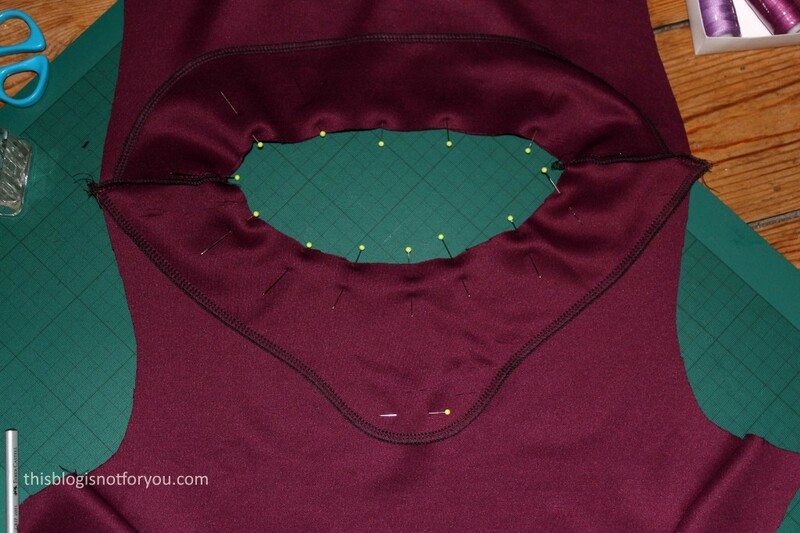 I cut down the centre, between the two seams, carefully clipping the corners to remove bulk. The corner are attached together with a tiny glass pearl and some hand-sewn stitches. It’s a very simply method, but it’s quite effective and looks very pretty and elegant. I love the fabric and quite like the colour. But I’m not too convinced that I like the silhouette. 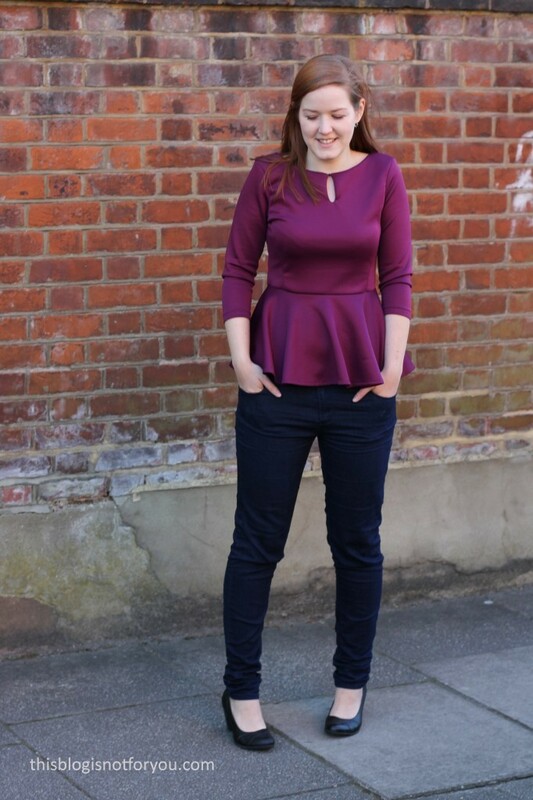 I love peplum shapes on others, but it doesn’t do me any good. Maybe it’s the proportions? 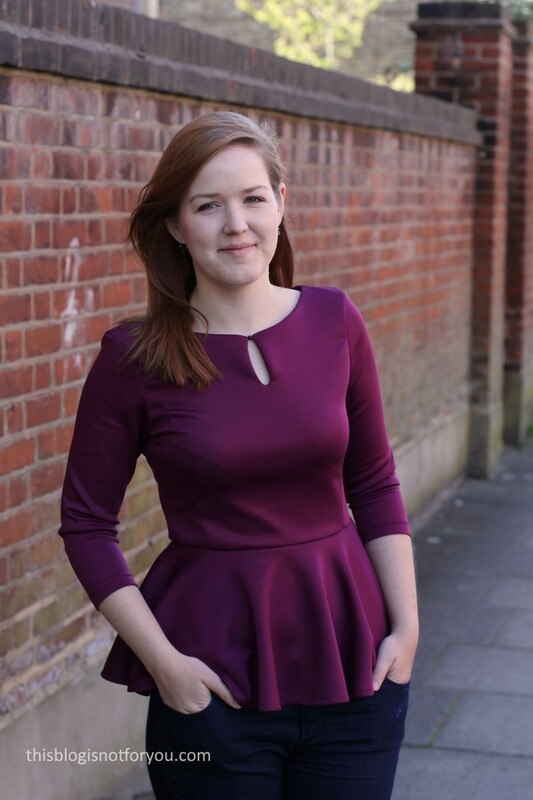 Should the peplum skirt be a bit shorter? The bodice longer? I don’t know.It’s just not as flattering as I thought it would be. Could also be that’s it’s not the perfect shape for people with sway backs. Whatever it is, I will probably steer clear of peplums for a while! 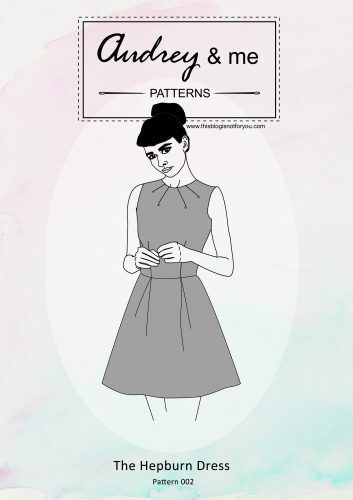 Now I’m looking forward to tomorrow – I have a brand-new Vogue pattern stash waiting for me to trace and muslin. What are you doing? Have a great weekend everyone! This is SO CUTE. I love the color, the sheen, and the proportions. I love the little key hole necklin and the colour is amazing on you. I had the same feelings about problem tops when I wore them with any type of jeans or trousers but with a pencil skirt I think the silhouettes so better on me so maybe try that outfit combo to see if it also works for you too. I have to say, I love your peplum and that keyhole! And the color looks great on you. I actually think the style looks good on you. 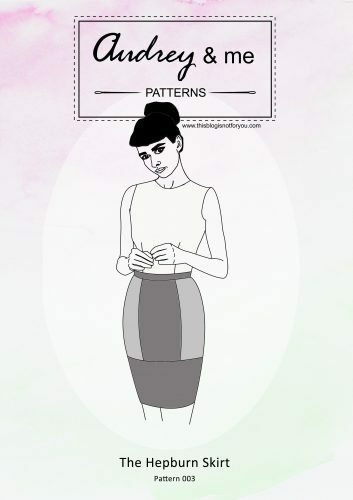 Have you tried wearing it with one of your pencil skirts? That might look really classy? I’ve worn it with one of my pencil skirts and it does look really good. But it has to be a super fitted one so that it doesn’t look weird together. I love the neckline on your top. The top looks good on you, I’m just not sure about peplum tops at all. I think it’s because they always look as if they were going to be a dress, and also on nearly all the ones I’ve seen the waist doesn’t look in quote the right place, though I would say your is! That’s probably what I find weird about them. They look unfinished or as if something’s missing. It’s really hard to get the proportions right with peplums. 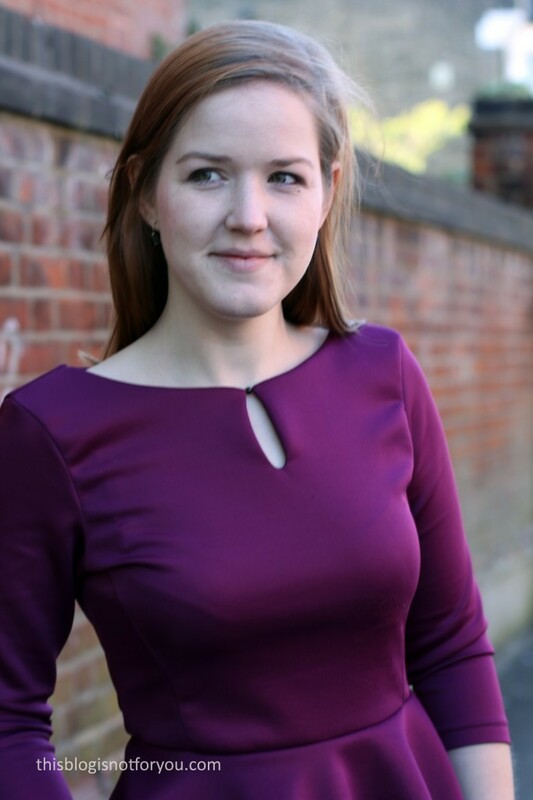 Love the keyhole neckline. And I love how the scuba jersey makes the peplum flare out even more. Thanks, Nathalie! The scuba gives it that extra bit of volume which I also really like! 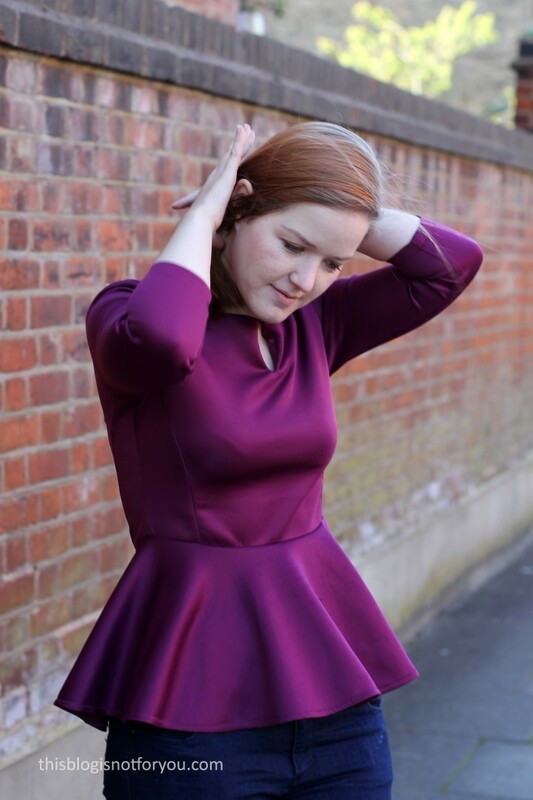 Hello, I think the keyhole, the colour and the peplum are all fab! 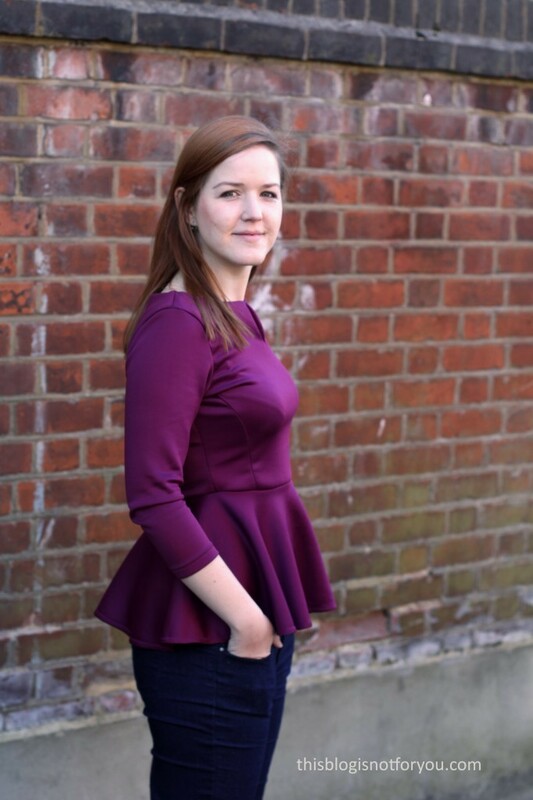 But if you don’t feel good about the peplum, don’t worry, don’t wear it – it’s your call! What about a peplum that is longer at the back? It might feel less like a frill at the back. I can’t stand the peplums on me, either, but I’ll tell you what other people told me when I posted mine (because it’s true) – I think you look great! I totally get not feeling like it’s “you,” though. You look gorgeous. The color of the scuba is so beautiful & deep. Lovely make! Peplum are weird I agree. Where should they sit!? How long should they be!? One thing I do know is that the keyhole is a great addition and I love the berry colour. It does look nice on you but how it looks and how it feels to wear are two different things! I love the color! Also this peplum pattern is just what i have been searching for. Love it!